The letter ‘M’ on her right lower rib cage. 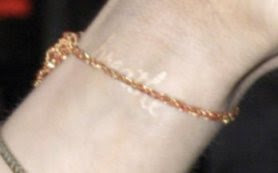 Three circles on her left wrist, and the word ‘redemption’ on her inner elbow joint. 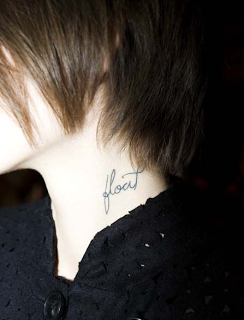 the word ‘float’ on the left side of her neck. she also has a tattoo on the lower part of her stomach and lines on one of her fingers. 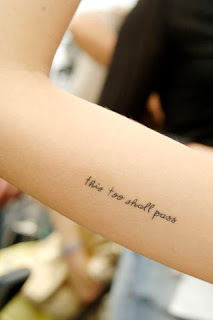 Shakespeare quote on her right shoulder blade. Brian – the name of her boyfriend. Still missing her tribal design on her left wrist which she considers a mistake because it was done by a stoned tattoo artist. 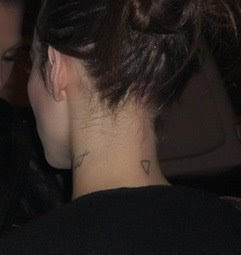 the number seven on the back of her neck. 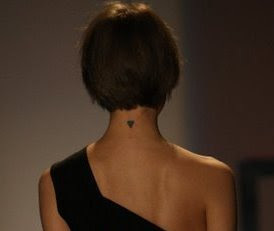 said to have up to seven tattoos, most are tiny and not easily visible. a symbol for eternity on her right inner elbow joint in white ink, there is suppose to be one more that i can’t quite find. i found the 7th one. it’s hard to see, but it’s actually a red star on her right hand. It’s the same placement as the heart on her left hand. she’s added to more to her collection. 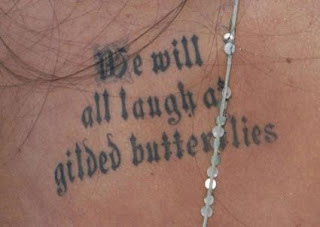 She has also added a Marilyn Monroe quote on her wrist to the collection, but i’m stilling waiting for a picture of it to surface. 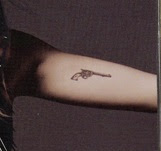 No idea if she still has this tattoo cause i can’t seem to spot it in any of her other pictures.